NIKE’s new ‘ARE WE RUNNING TODAY?‘ ad got our attention. The AD that appears on the 7th page of the Us Weekly magazine is definitely a work of taste. CELEBERITY PARKS CAR IN PARKING LOT. CELEBRITY WEARS MAKEUP ON FACE. CELEBRITY WEARS NO MAKEUP ON FACE. CELEBRITY WEARS WARRINGS IN EARS. ANOTHER CELEBRITY EATS OTHER OOD. CELEBRITY WALKS ON PAVEMENT WITH CHIHUAHUA NAMED TEQUILA. CELEBRITY WEARS BIKINI ON BEACH. CELEBRITY WEARS GYM CLOTHES ON WAY TO GYM. CELEBRITY WEARS CLOTHES ON WAY HOME FROM GYM. CELEBRITY TAKES KID TO SCHOOL. MALE CELEBRITY DATES FEMALE CELEBRITY. MALE CELEBRITY DATES MALE CELEBRITY. FEMALE CELEBRITY DATES FEMALE CELEBRITY. CELEBRITY WEARS ENGAGEMENT RING AFTER PROPOSAL. CELEBRITY SHOPS FOR CLOTHING AT CLOTHING STORE. YOU JUST WON BACK 45 MINUTES TO RUN. The ad is genius because it’s not selling a product. It’s selling a lifestyle. Nike is not showing a picture of their shoes anywhere in the ad. In fact, it’s not showing a picture of anything except the logo- their symbol and trade mark, that says it all. The idea behind the ad is clever. And what is the idea? That time is everything. But a good idea is not everything. It’s also about the execution. 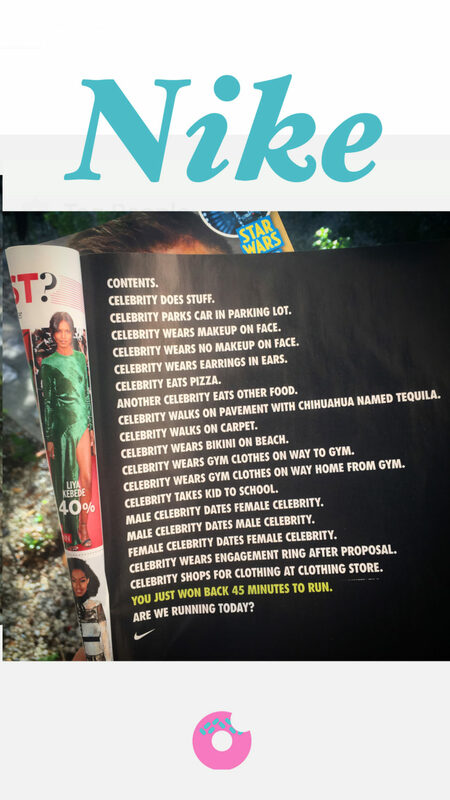 Because this Nike ad appears in US Weekly is funny and ironic because it’s kind of mocking the magazine by indirectly calling it a time waster and suggesting that instead you should go running. Good point, Nike! I think I will!